It’s something no human has ever seen before: as a star reaches its terminal phase, it blows up the system around it. This was revealed by NASA’s Kepler K2 mission; this telescope looks for planets by spotting the dip in the brightness of stars as something passes in front of it. Astronomers weren’t necessarily surprised to observe this – it’s something they theoretized for decades, but hadn’t yet caught in the act. The star is a white dwarf – like the Sun will also become, billions of years in the future. Scientists firsts noticed some unusual dipping patters in its light, so they pulled out further detail through ground observation. They realized that the main transit every 4.5 hours was accompanied by several additional chunks of material and a comet-like pattern – signifying that the dwarf planet around the star is breaking up. Researchers estimate that this will also ultimately be the fate of Earth, but don’t worry – the planet will have become uninhabitable way before that. Basically, what’s happening is the extreme gravity from the white dwarf is ripping the planet to shreds, leaving behind some big chunks, but also a dust cloud that reduces the planet’s brightness by 40 percent. “We now have a ‘smoking gun’ linking white dwarf pollution to the destruction of rocky planets,” said Vanderburg. 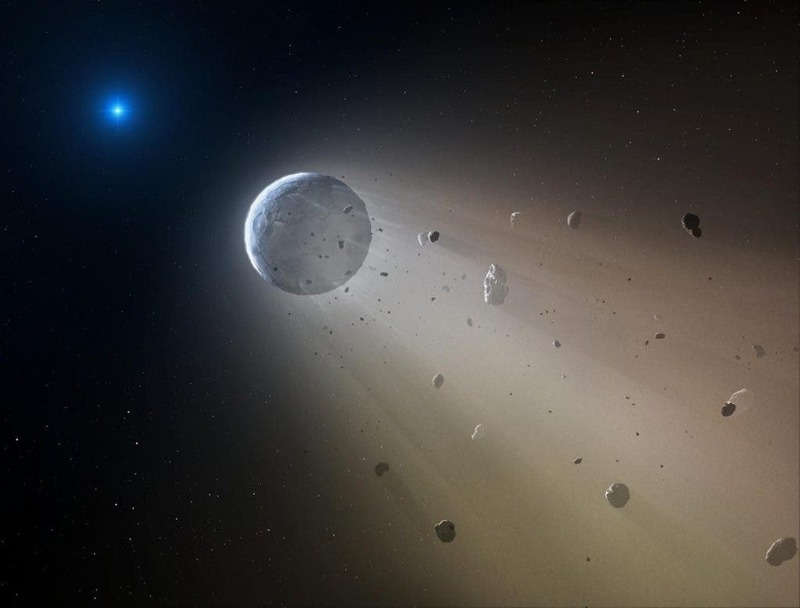 “Instead of being transited by a solid planet, the white dwarf was being transited by a planet that has a dusty, cometlike tail trailing behind it,” Vanderburg said. That tail, rather than just an isolated object orbiting, would make the starlight change unevenly over time. There are likely several fragments making the journey and entering astronomers’ view, Vanderburg added.